In late February 2018, I attended the South Central Writing Center Association’s conference with several of my colleagues from UT Austin’s University Writing Center (UWC). In honor of Praxis’ forthcoming special issue, “Race & the Writing Center,” I’d like to spotlight one workshop in particular from that conference that continues to resonate with me and has productively influenced our writing center: “Beyond Inclusion: Developing a Mindful Approach to Racial Justice in Tutor Training,” created by Natasha Tinsley, Hillary Coenen, Lisa Wright, and Fehintola Folerin. On Friday afternoon of the conference, the UWC’s Assistant Director Alice Batt and I participated in Tinsley et al. 's workshop, which included a series of activities that encouraged participants to reflect critically on race and their relationship to it. The workshop began with an anonymous online questionnaire, in which everyone in the room wrote about their writing center's current antiracist work (or lack thereof). As we submitted our answers, they immediately appeared on a projector at the front of the room, which quickly set the workshop's tone of honesty and goodwill. Collectively, our answers laid bare our centers’ various shortcomings but also the good work that they already do and our shared hope to do more. The second activity took us down a more personal path. 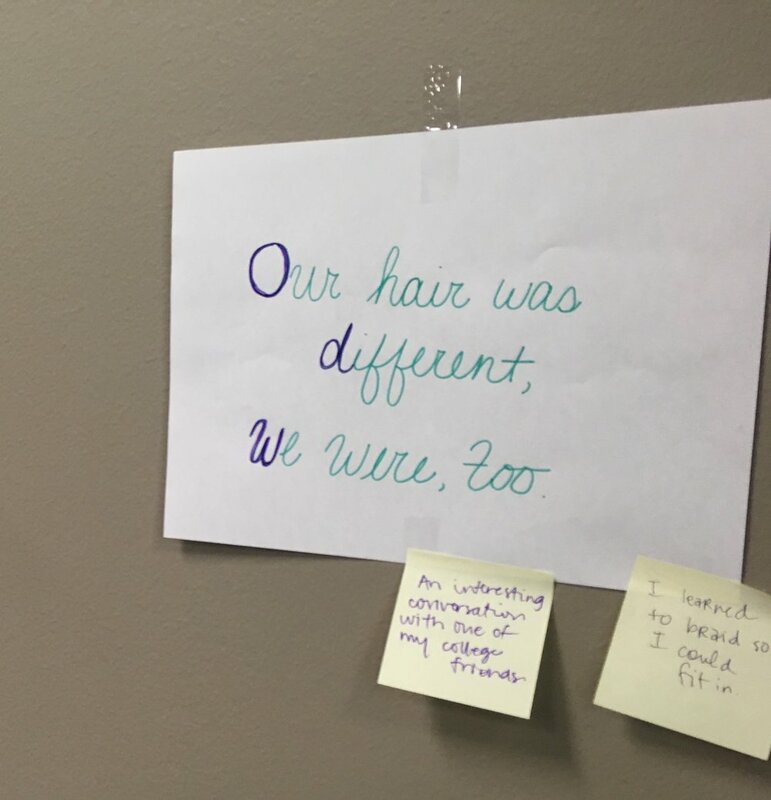 For a few moments, Tinsley and Coenen asked everyone to freewrite on a piece of paper about the first time we each became aware of race as a concept; next, they asked us to condense this incident into a brief phrase of approximately six words and to tape that paper on the wall for everyone to see. Again, importantly, this process was anonymous. Once all of our sentences were on the wall, we walked around and read everyone’s statements as if we were in an art gallery, and we were encouraged to leave comments on the statements with sticky notes. "Our hair was different, we were, too." Anonymous participant statement taped on the wall during Natasha Tinsley et al. 's workshop at 2018 SCWCA. Sticky notes pasted on the statement are anonymous responses from fellow participants. Our final activity was difficult in a more familiar way: in pairs, we worked through troubling scenarios of racism—all from actual events—and we discussed how we would respond as administrators and as consultants to these situations. I was paired with an enthusiastic undergraduate consultant, and we had a lively, thoughtful discussion. That said, I admittedly felt frustrated by the end of the activity. Instead of brainstorming or role-playing approaches we might take, as others were, we ended up spending most of our time processing my partner's personal reactions to the scenario in front of us. None of this is a critique of my partner. Rather, their charged response demonstrated compassion and sincerity—two great qualities in a consultant. However, what I realized in this activity was how likely it is that we all could react similarly when first confronted with racism in the writing center. Indeed, from what I saw in the workshop, many of us felt as upset as my partner had about the scenarios with which we were presented. Thanks to our different life and professional experiences, our abilities to respond to these scenarios range heavily. In my partner's case, they were an undergraduate who deeply wanted to perform antiracist work but who perhaps hadn't had many opportunities to prepare for it off the floor. Frankly, I'd say that many of us in the writing center can relate to that. As writing center administrators, we must create training opportunities in which we all can wrestle with these uncomfortable hypothetical situations so that if/when these situations happen, we are more emotionally and professionally prepared to handle them. Useful as it is to regularly discuss the importance of antiracist work, we also need to regularly practice it. Tinsley et al. 's workshop presents the means to do so with its challenging, welcoming, and accessible series of activities. Alice completely agreed, and a few months later, I, with the help of some members of the UWC’s administrative team, recreated the second and third activities from Tinsley et al. 's workshop in Alice’s “Writing Center Internship” course. Whereas the group in the SCWCA workshop was comprised entirely of experienced staff and only a couple undergraduates, our workshop was comprised entirely of undergraduates—none of whom had yet worked in the writing center. "I deserve to be here and to exist." Anonymous student statement taped on the wall during in-class workshop in RHE 678C: Writing Center Internship in spring 2018. Sticky notes pasted on the statement are anonymous responses from fellow students. The experience of putting on this workshop was incredible, thanks to our soon-to-be consultants who fully embraced the value of antiracist work and the challenges they may face while performing it. In one week, these new consultants will begin their work in our writing center. During our orientation a few days ago, I saw them for the first time since the workshop. They were hard to miss—amongst our crowd of new and returning consultants, I could spot always spot the eager smiles of the internship group. This eagerness, I’ve learned in my time with them, comes from a desire to truly help and support their peers, and thanks to training workshops like Tinsley et al.’s, they feel even more confident that they can do so.